Several weeks ago I managed to drag my reluctant daughter to the “Sicilian Crossings” exhibit at Stony Brook University. It had been launched at the Ellis Island Museum where it was fairly well received. The exhibit consisted of 120 panels depicting the story of Sicilian immigration and their assimilation into a new country via photos, letters, tickets and various other items. I told my daughter we were lucky to have the opportunity to see such an exhibit so close to home. She was not in the least bit excited, but I played the guilt card, that we needed to spend some quality time together (which we did), and she put her jacket on. I expected to be able to have full run of the exhibit even though it was a beautiful Sunday afternoon. How many people out here on this end of Long Island had any interest in such a thing? People responded when the exhibit was on Ellis Island because it was part of the tourist experience. In these parts if you’re not interested in sandy beaches, malls and franchise dining, pick a different spot. 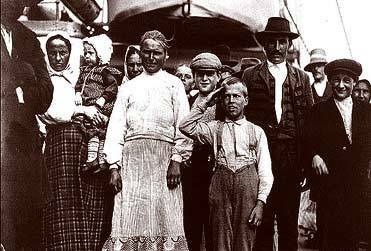 Now, being Sicilian and coming over to America during the late 19th and early 20th centuries was an unfamiliar story to anyone in my family. They all stayed put in Rimini, Ravenna, Ferrara and Bologna while the masses from Sicily and the mezzogiorno were on their way to La Terra Promessa. I do remember most of the friends my parents met here in New York being Sicilian. They spoke differently from my parents, and they were very animated and warm people. My father would always say that he knew many more Sicilians here than he ever did in Italy; even during his years in the navy. All these folks seemed to own their own businesses, they were skillful tradesmen and crafty businessmen. Other than knowing common places in Sicily, (like Mondello) or having some mutual experiences here in NY (usually anti-Italian experiences) or rooting for the same soccer team, there was not much more they had in common. So needless to say this exhibit would be something of a learning experience for my daughter and me. I realized something very profound when my daughter fed me this fact. I realized that I was really lucky, because I was a first generation hyphen. In 100 years my great grandchildren would be trying to figure out the story of my Italian parents, just as these 70 year old people were doing at the Wang Center. For now though, I learn all about Italy first hand, from my parents and my own experiences there. I’ve had a piada generously spread with warm stracchino at one of the many cafe/bars on the beach in Rimini, I don’t need to hear a story about it, I was there…..often. It was touching to see such a large amount of people seeking their origins. These legendary immigrants must have had so many stories to tell. Unfortunately the legacy has already been severely diluted. And so we are forced to look at picture stories about the sulphur mines, the Messina earthquake, the conditions on the ships and the terrible prejudices they encountered in their new home. They have become entities unto themselves now, as foreign in the year 2008 to a 70 year old Italian-American as to a 70 year old Italian, indeed light years away from the “olive garden” genre previously mentioned in this author’s repertoire. It’s funny how I can now realize that the unique distinction of being Mezza Via; halfway in between Italian and American, can also be a privileged one.